The latest edition of this pioneering text atlas incorporates all the advances that have taken place in the field over the last decade. Minimally invasive procedures are now established as the method of choice for many applications in equine orthopedic surgery, not only as an aid to diagnosis, but also as an alternative to conventional surgery. The text has been completely revised and massively expanded to reflect the rapid growth of this specialty, and covers many important new applications and techniques. It also features new full-color, high-quality images throughout. 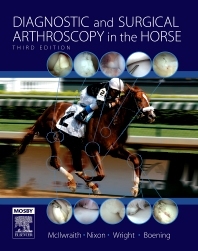 Diagnostic and Surgical Arthroscopy in the Horse remains the most comprehensive reference available, providing both authoritative information and practical guidance on all aspects of this important technique.